In 2012’s Sinister, we got a horror tale that revolved around the terror caused by an evil spirit known as “Bughuul”. Old Buggy’s antics become the basis for the film’s sequel, 2015’s Sinister 2. In this next chapter, Courtney Collins (Shannyn Sossamon) moves into a rural farmhouse with her twin sons Dylan (Robert Daniel Sloan) and Zach (Dartanian Sloan). They do so to elude the notice of Courtney’s ex Clint (Lea Coco), a nasty piece of work who wants to reclaim the kids. Dylan experiences nightmares and seems haunted by something about the new home. Ghosts led by Milo (Lucas Jade Zumann) tell him that if he watches horrifying home movies, the bad dreams will dissipate. A veteran of a terrible incident that took place on the location where Courtney and kids now reside, ex-Deputy So-and-So (James Ransone) maintains a continued interest in the property, and he remains spooked by what he saw. We follow all parties as they converge and deal with the ramifications of the evil at work. Due to the terror known as “I didn’t get a review copy”, I never saw the original Sinister, so Sinister 2 acts as my introduction to the characters and situations. Given my experiences with most modern horror flicks, I didn’t expect much. 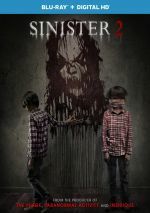 Today’s horror movies tends to be long on cheap jolts and short on actual scares, so I doubted that Sinister 2 would deviate from that trend. Does it? Not really, though the film manages to make a dent due to those home movies shown by Milo and company. These depict events like a family buried alive and victims fed to alligators. The use of 16mm footage gives them a sense of verisimilitude and they offer by far the film’s creepiest, most haunting moments. Unfortunately, the rest of Sinister 2 follows a fairly standard path. Actually, it creates an odd narrative, as it mixes the horror elements with domestic drama between Courtney and her ex Clint. The whole custody dispute feels like a superfluous addition, especially when Courtney and the ex-deputy engage in a romance. The story ties these components together by the end, but I still don’t think they work especially well. Outside of those spooky home movies, the horror elements don’t become particularly compelling either. Perhaps I’d have been more invested in the scares if I’d seen the first film, but I doubt it – I don’t get the sense that Sinister offers a real prerequisite to a viewing of the sequel. All of this adds up to a lackluster horror experience. Some aspects of it succeed, and others show promise. In the end, however, the final result relies on too many standard attempts at scares and the movie lacks much real impact. Sinister 2 appears in an aspect ratio of approximately 2.40:1 on this Blu-ray Disc. The movie boasted a positive presentation. Sharpness seemed good. Only the slightest hint of softness occurred, and not with any frequency. Overall clarity remained solid, and the image lacked problems like jaggies, shimmering and haloes. No print flaws marred the presentation. Like virtually all modern horror flicks, Sinister 2 went with a stylized palette. We got a chilly teal most of the time, so don’t expect anything dynamic. These tones suited the movie. Blacks were reasonably dark and dense, and shadows were smooth. This turned into a well-rendered image. The disc’s extras open with an audio commentary from director Ciaran Foy. He provides a running, screen-specific look at story/characters and the continuation of the first film, sets and locations, music and audio, cast and performances, editing, visual design, and related areas. Foy offers an energetic and highly informative chat. He touches on a strong array of topics and does so with gusto and frankness. Foy makes this an enjoyable and educational discussion. Five Deleted Scenes run a total of nine minutes, 22 seconds. We get “New Chain” (1:09), “A Late-Night Warning” (2:35), “Stupid Bird” (1:36), “Lipstick” (2:00) and “Stomberg’s Last Drink” (2:02). Some of these offer decent exposition, but others – like one that illustrates the violence potential of the twins – seem redundant. We also don’t need more footage to demonstrate how awful Clint is. Most of these scenes deserved to be left on the cutting room floor. Six more clips show up under Extended Kill Films. We see “Fishing Trip” (1:32), “Christmas Morning” (1:34), “Kitchen Remodel” (1:41), “A Trip to the Dentist” (0:35), “Sunday Service” (3:05) and “Cornfield” (3:11). In these, we view the violent “home movies” seen in Sinister 2 in longer versions. They offer a good addition to the package. Time to Watch Another: The Making of Sinister 2 runs 10 minutes, 11 seconds and features Foy, producer Jason Blum, writer Scott Derrickson, stunt coordinator Jim Fierro, fire coordinator Eddie Fernandez, stuntman Eddie Fernandez Jr., effects designer Roy Knyrim, prosthetic application Rob Hinderstein, and actors James Ransone, Shannyn Sossamon, Robert and Dartanian Sloan, Lucas Jade Zumann, Jaden Klein, Laila Haley, Nick King and Lea Coco. We learn how Foy came to the project, story/character areas, cast and performances, the “kill films”, effects and stunts, and connected domains. “Time” offers a basic but satisfactory overview. The disc opens with ads for London Has Fallen, Straight Outta Compton, The Green Inferno, The Visit and The Forest. Previews adds promos for The Purge, The Purge: Anarchy, Curve, Visions, Everest, Ouija and Unfriended. No trailer for Sinister 2 appears here.